Restore find 10/3/12. Now I have found a Killerwatt 22w unit after getting a couple 20w units earlier at a different Restore. I had an issue with this lamp it wouldnt light, turned out the starter was shot. Now it works fine! 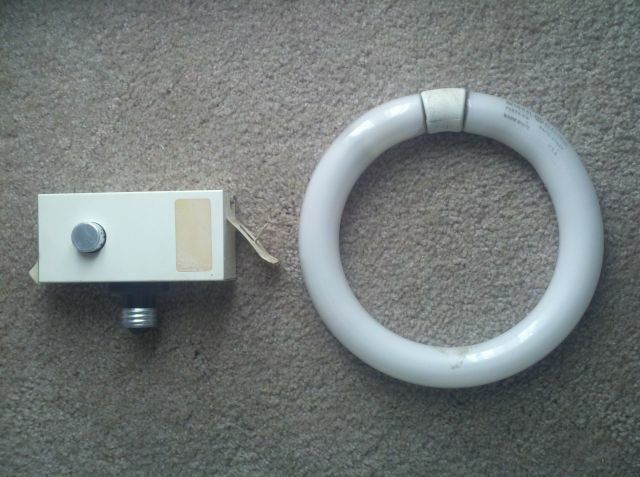 The GE warm white lamp is from 4/77, it still has the old style ceramic base which I didnt know was made that late (but Sylvania circlines still had them in '78). Nice retrofit Adaptor. The first version of 2 part CFL, lol. I am wondering if they made a two 22W lamp version? Way cool find! This is quality you don't find anymore. That is awesome!! I love the one 20 watt unit I have. REALLY love your dual one! boring lamp.....I seen tons of 22w everywhere. This site is so boring I want to fall asleep..ZZzzzz. @imj, what the HELL?! This is not typical "throw away" junk and many of us LOVE well made tubes/fittings/gear. LOL. The tube is one month younger than me. Is it really old? I am afraid - yes. It‘s time for mid life crisis. @IMJ this is an OLD one from 1977, sturdy and top quality as others said. Thats why it's here. Can't you appreciate good vintage stuff? Quote from imj: "boring lamp.....I seen tons of 22w everywhere. This site is so boring I want to fall asleep..ZZzzzz." Remember the old adage..."if you don't have something nice to say, don't say anything at all." Or at least, don't be snide in your commentary. Everyone is entitled to his/her opinion, but that was not a nice thing to say. Wait, curcline tunes had ceramic bases? Also, what ever happened to imj? Yes that porcelain base was typical on 1970s and earlier American circlines.